Welcome to the Mission Bay Hotels; the gem of San Diego! We offer over a great selection hotels and accommodations in and around Mission Bay and are your single source for the best local rates available. Whether you're here for a day, a week or a month, our Mission Bay hotel guide will help you find the perfect accommodation, suited expressly to your needs. All of our hotels are approved by AAA and Mobile Travel Guide, the authorities in hotel inspection. All hotels offer a generous savings off of regular hotel rack rates. 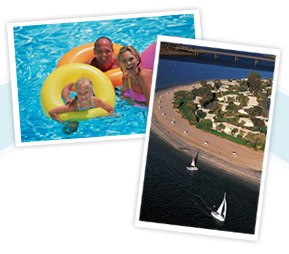 Book securely online for great rates on hotels near Mission Bay! San Diego may well be the prototypical Southern California city. Visually, it brings to life the timeless images evoked by the Beach Boys' 1965 pop classic, "California Girls": sunshine, sand and palm trees. Paradise Point Resort and Spa is an island oasis of blue skies, pristine beaches and tropical gardens set amid the sparkling waters of San Diego's Mission Bay. The resort features it's signature single-level bungalows, each with a semi-private patio looking out across the lush botanical gardens. . .This is the true essence of a California coastal retreat.